We Capetonians are tarnished for our work-aversion malady known as the Cape Coma. But it the shared love for our beautiful mountain that most grounds us. But it has not always been so – the mountain that is, not our fondness for recreation. Table Mountain has gone by many names in times past. The oldest we know of is Hoerikwaggo (mountain of the sea) that was used by the Khoi who were living in its shadow when Europeans first arrived by sea in the late 1400s. You might be surprised to know that the ancient Greeks, who never saw the place, had proposed an earthly paradise in the southern hemisphere, situated around a flat-topped mountain (there was even a bay with an island). On reaching the Cape in the late 1400s the Portuguese came, saw, decided this was the place and named it Prassum Promontorium(that and the “cape of storms”). But a century and a half before the Portuguese rounded the Cape, in the Divine ComedyDante described how, after sailing for several months south, he came to a flat-topped mountain rising out of the sea, surrounded by forests, from which two streams flowed. Dante even gave this vivid description, in his Paradiso: Upon the top of this promontory Nature … has formed here a great plain, pleasant in situation, which with the fragrant herbs, variety of flowers, and flourishing verdure of all things, seems like a terrestrial paradise. 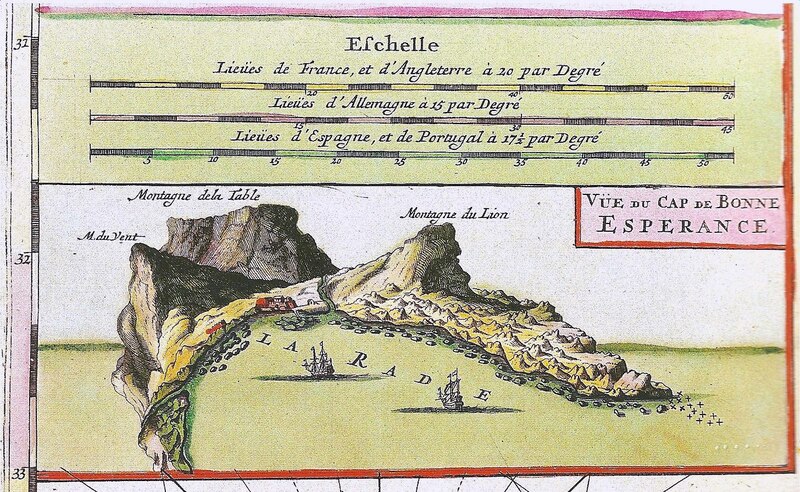 Much later, in the mid-1660s (by which time the Dutch had set up shop here) in his epic poemOs Lusiadas, Portuguese poet Luis Vaz de Camões invented the Titan Adamaster, cast in the stone of the mountain (a relative of Atlas in the north) who jealously guarded the Cape by throwing up violent storms in order to prevent ships from passing. It is thought to have been Admiral Antonio da Saldanha who first used the table metaphor when, after climbing the mountain in 1503, named the place Taboa do Cabo, or Table of the Cape. 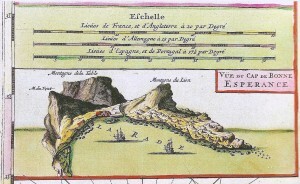 Since then it has been called (in historic order) Mons Mensa, La Montaigne de la Table, Tafelberg, Table Hill and Table Rock. Early names for Devil’s Peak and Lion’s Headwere Windberg and Sugarloaf. It is also the only feature on Earth that has given its name to a heavenly constellation, Mons Mensa – which could become the subject of a future post. But it is the original Khoi name of Hoerikwaggo that remains the most apt, as we’ll find some time later.